MicroFill™ offers an economical, compact, and reliable alternative to existing microplate dispensers. Accurate and precise dispensing are guaranteed without the time-consuming recalibration, cassette replacement, and maintenance commonly associated with other dispensers available today. Autoclavability is standard available for those applications requiring a sterile fluid path. Using BioTek's vast expertise in liquid handling, MicroFill™ incorporates a microprocessor controlled syringe pump for optimal performance. 24-, 96- and 384-well standard microplates and deep well blocks are accommodated with flexible volume ranges from 5 µL to 6,000 µL per well. 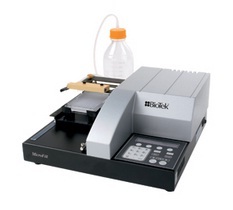 MicroFill's compact footprint makes it ideally suited to fit inside laminar flow cabinets. The user-controlled dispense flow rates allow low- to high-velocity dispensing for any application.